For Thanksgiving, we travel. For Christmas, WE ARE HOME!!! I love cooking for Christmas Eve, spending time in the kitchen always gets me excited for the big night. As we bake and cook, and smell all the things that bring back memories of Christmas’ past – it gets me so excited for the big night. But you wanna hear something funny? Christmas day…I don’t cook. Not one little bit. In fact, my family tradition on Christmas day is Chinese food. 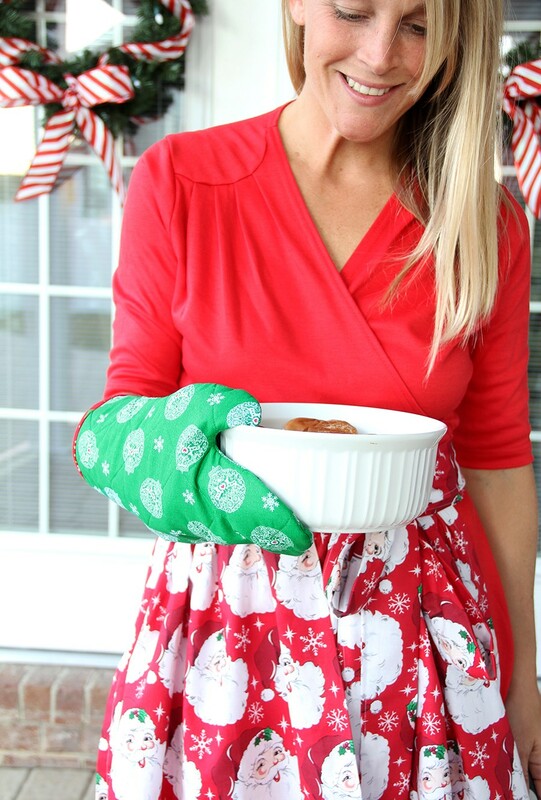 So while I may spend all day in the kitchen on Christmas Eve, come Christmas day – I am in my pajamas and loving it! 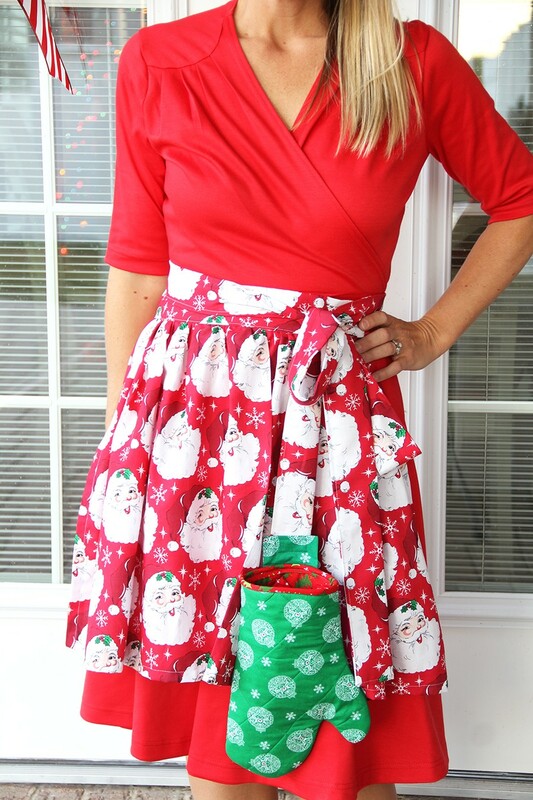 This year I decided to make a cute new apron to wear for the festivities, with this absolutely adorable Santa fabric I found. 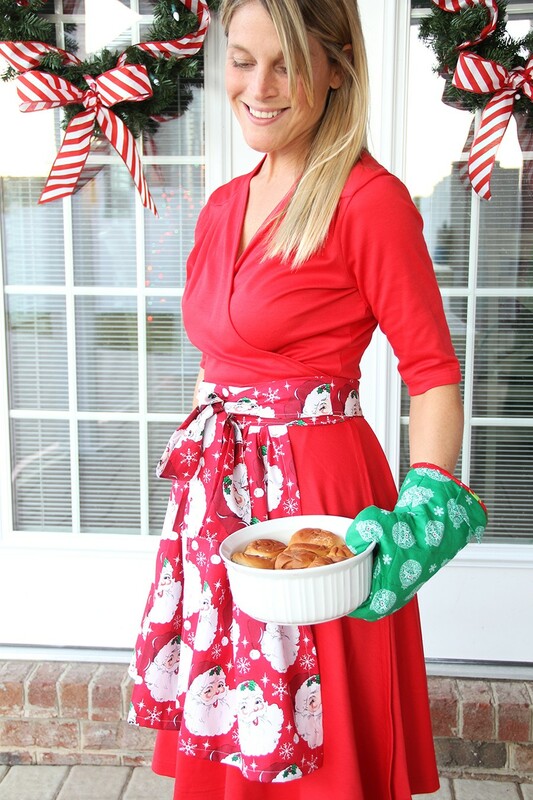 After all – don’t you cook in a fancy red dress? 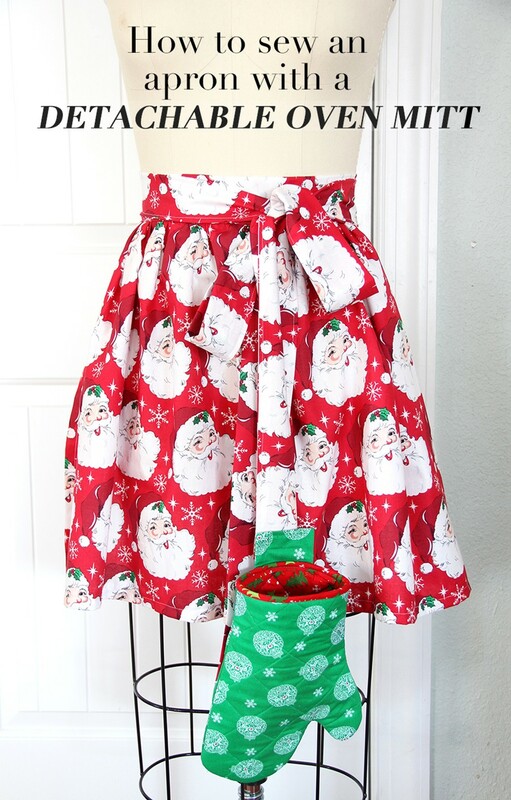 lololololololololololololol – but seriously, this apron in this Santa fabric is the cutest! For a fun spin this year, I decided to add a detachable oven mitt. 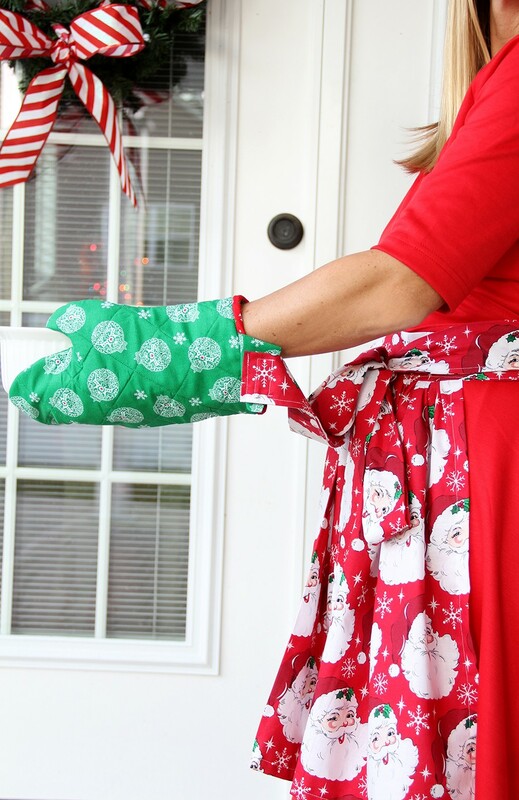 I am always managing to misplace my oven gloves, and while a pocket always works, I thought it would be fun to have the oven mitts swinging from the bottom of my skirt. Ha! Simply use the velcro to attach the oven mitt to the apron tie, and unhook the mitt when you want to use it! 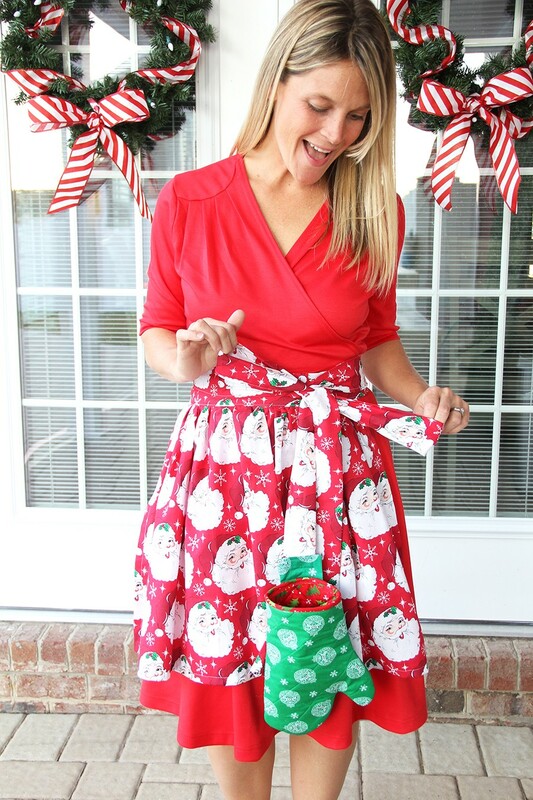 It’s my new holly jolly Christmas apron, and I am loving it. *Please note, this apron is purely for decorative purposes. For a more protective apron, please consider adding extra fabric layers or cotton batting to the pattern. Cut out pattern pieces as indicated above. Fold the outer edges and bottom edge of the apron rectangle main pattern piece ½” towards the wrong side and press. Fold again ½” and press. 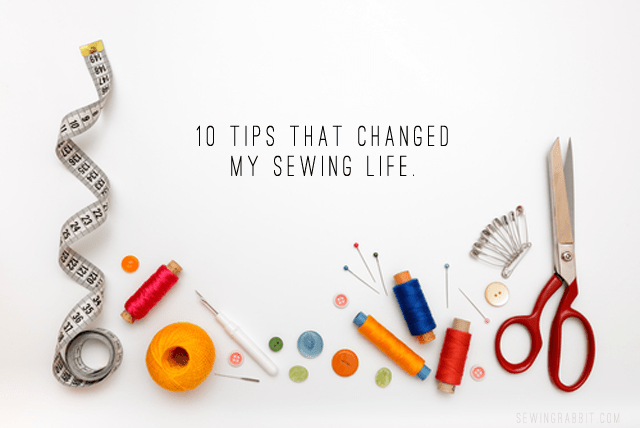 Sew around to secure side edges and hem in place. Sew a gathering stitch along the top edge of your main apron pattern piece. Gently pull the bobbin thread until the top of the apron is 15” wide. Make sure the gathers are nice and even. Fold the top and bottom edges of the 16” rectangle of fabric ½” towards the wrong side and press. Unfold the bottom edge, and place the bottom edge right sides together with the top gathered edge of your apron skirt matching up the raw edges. This will be your apron waistband. 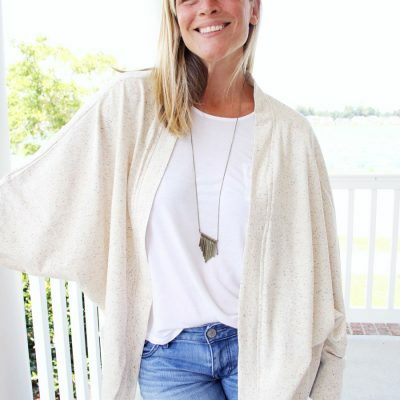 Make sure that there is ½” on either side of the waistband, extending out beyond the apron skirt, with the apron skirt centered in the middle. Pin in place and sew to secure. Trim seam allowance to remove excess fabric bulk. 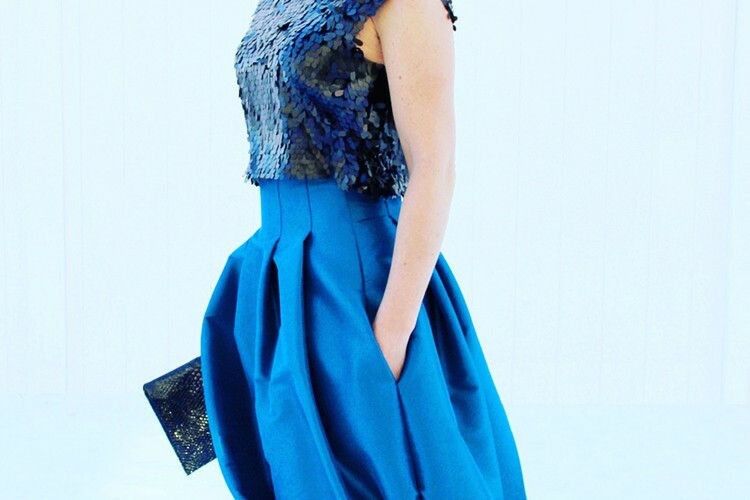 Fold the top skirt band over the raw gathered edge of your skirt, towards the inside of your apron. 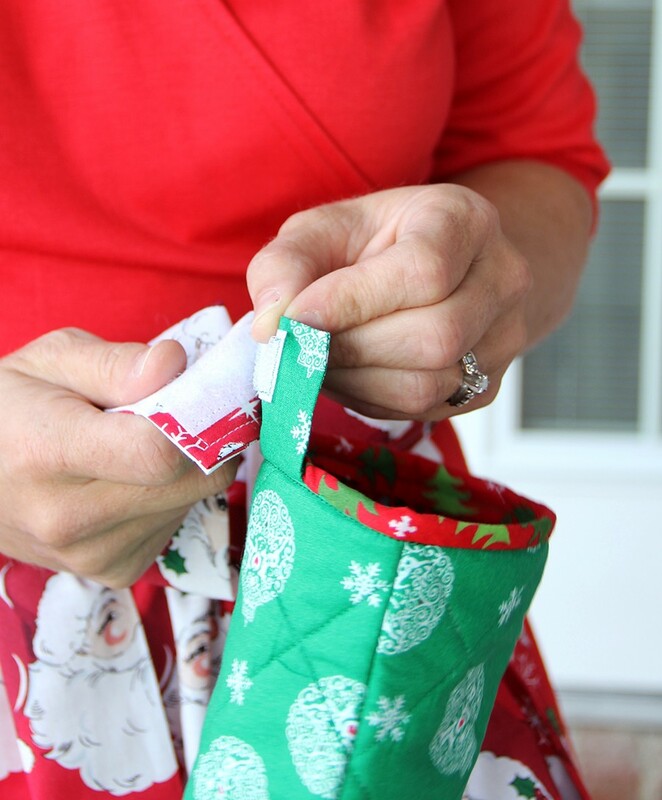 Place the top folded edge of your band, so that the folded edge slightly overlaps your sewn seam. Pin in place to secure, and either sew the bottom edge by machine or whipstitch by hand. Press. Fold the top and bottom edges of the 44” rectangle of fabric ½” towards the wrong side and press. Fold in half, enclosing all raw seams so that the folded edges meet up. Press. Sew along the bottom folded edge to secure in place. 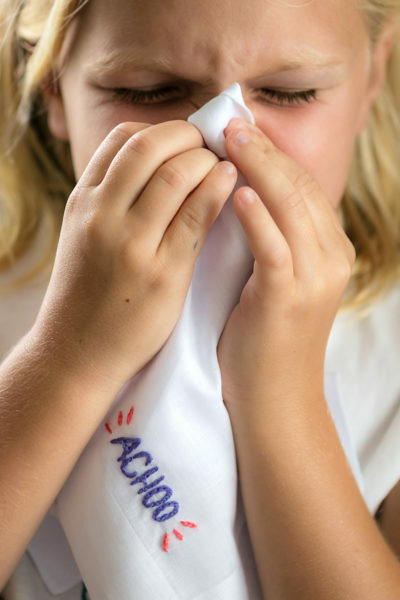 Repeat for both pieces. Fold one side raw edge of the 44” rectangle of fabric ½” towards the inside of the tube and press. Slip folded edge over the raw apron waistband edge, so that the raw edge of the waistband is inside your apron tie. Pin in place and sew. Repeat for other side of waistband with opposite tie. Fold the other raw edge side of the apron ties ½” towards the inside of the tube and press. Sew in place to secure. Pull your velcro apart separating the hooks and loops. The hooks are the rough side, and the loops are the smooth side. Place the hooks on the bottom edge of one of your apron ties. Pin in place, and sew around the outside edge of the velcro to secure in place. Print out oven mitt pattern, and cut out pattern pieces as indicated. Place the oven mitt lining wrong side up, then place your layer of Insul-bright, then your layer of cotton batting, and lastly your exterior oven mitt right side up. Make sure all of the layers are nice and flat, smoothing them out. Pin layers together in various spots to ensure that they do not shift. Quilt together as desired. (I used a ruler and fabric marker, and drew straight lines across the pattern). Repeat for other pattern oven mitt pieces. Place front oven mitt and back oven mitt right sides together, with the exterior fabric together. Pin around all side edges and sew. Trim seam allowance, making sure to clip where the thumb meets the hand. Turn right side out and press. Fold the detachable strap pattern pieces in half, right sides together. Pin along the short side edges and sew. Trim corner seams, turn right side out and press. Align the raw edges of the detachable strap pattern piece with one side of the oven mitt raw edge. Pin in place. Sew bias tape to open edge of oven mitt to finish. Be sure to push the detachable strap up / out of the way when sewing the bias tape to the inside of the oven mitt. Sew the loops side of the velcro to your detachable strap pattern pieces to finish. I can’t wait to start cooking this weekend for Christmas!!! EEK!! Woo hoo……the Christmas spirit has really gotten a hold of me this year, and I am loving it :).